Plans to protect and encourage London's wildlife will be unveiled today, as the London Assembly release recommendations to ensure that new housing developments enhance the capital's biodiversity. One development near Tower Bridge will have beehives installed on its roof. A report has exposed the shocking scale of so-called 'wildlife crimes' committed in the capital. The World Society for the Protection of Animals - which part funds the Met Police's Wildlife Crime Unit - says it has crimes reported to them everyday, ranging from the capture of songbirds to the smuggling of endangered species into London. It is unusual for five animals to be in the river...as porpoises tend to be seen alone, and in smaller groups. It isn't possible to say whether the tidal surge is the cause of the porpoises being in the river, but it could well be related, either to the tidal movement, or as a response to the particularly rough seas beforehand. The outer Thames Estuary would have been relatively sheltered from northerly offshore winds. The pod should be able to navigate back to sea, and pass through the Thames Barrier when the tide goes out and the barriers are opened. Porpoises pictured swimming in the Thames by Vauxhall Bridge in December 2004. The mammals have been sited over the years but there are no official records of them being found in the Thames. Lots of talk about #porpoises in the #Thames . When we head out on exercise later we will keep our eyes peeled & will share any pics we get. We have been unable to photograph the #christmasdolphins so far. They seem to be working thier way further upriver. Last seen at Battersea. Send us your porpoise pics! 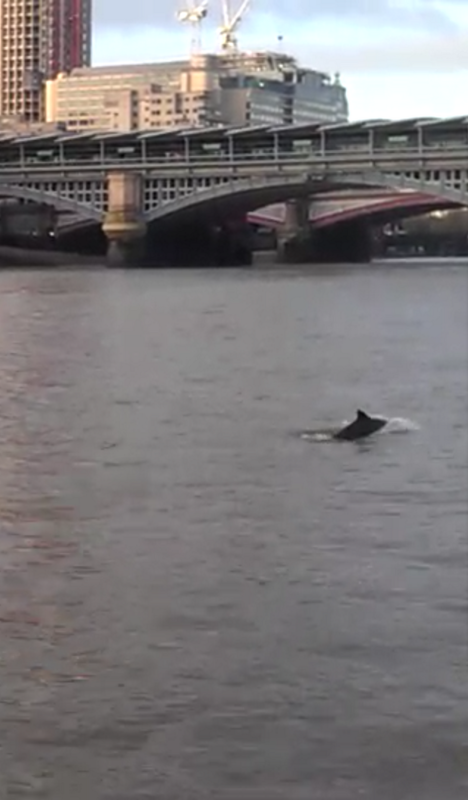 Have you seen the porpoises in the Thames? Tweet us your sightings to @itvlondon!